Our first stop in the last frontier was Fairbanks, which is surprisingly closer than Anchorage when traveling by car due to the lack of highway infrastructure. I expected Fairbanks to be the mountainous land that much of Alaska is thought to be by most 48ers (people who have never been to Alaska and/or Hawaii). However, it was quite flat and full of forestry. The town of Fairbanks was nothing special. We spent our first night back in the “U.S.A” at one of Fairbanks few RV parks, mostly because we wanted the essentials that we had been missing since leaving the Washington/Vancouver region: showers, pizza & cell service. While I can still taste the repulsive ranch dressing base that made me regret every bite of our chicken bacon ranch pizza from Great Alaska Pizza Co., at the time it was delicious (for the first 10 minutes, at least). We caught up on some quality TV and Brooke even got a little work done. We weren’t at this mosquito-infested excuse for a campground for long, but we took advantage of all its amenities that night and took off into the forest the following morning. Denali! The highest mountain peak in North America. 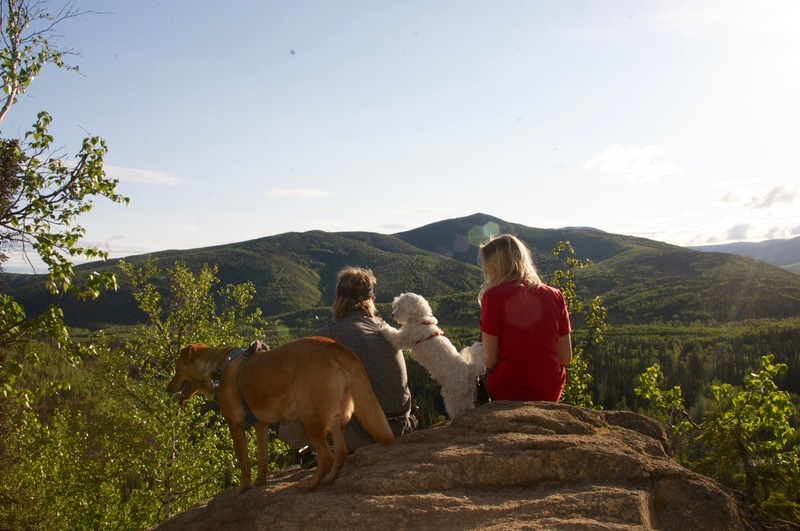 The Chena National Forest is located just outside of Fairbanks with several campgrounds to choose from. Like most areas of Alaska, there was only one road to take and it dead- ended at the cleverly named Chena Hot Springs which we visited on our final day in the area (more on that in a bit). All along the road that cut through the forest was a plethora of fishing holes and trailheads. The one trail with the most appealing features was Angel Rocks, with the main attraction being its angelic rock formations (big surprise). 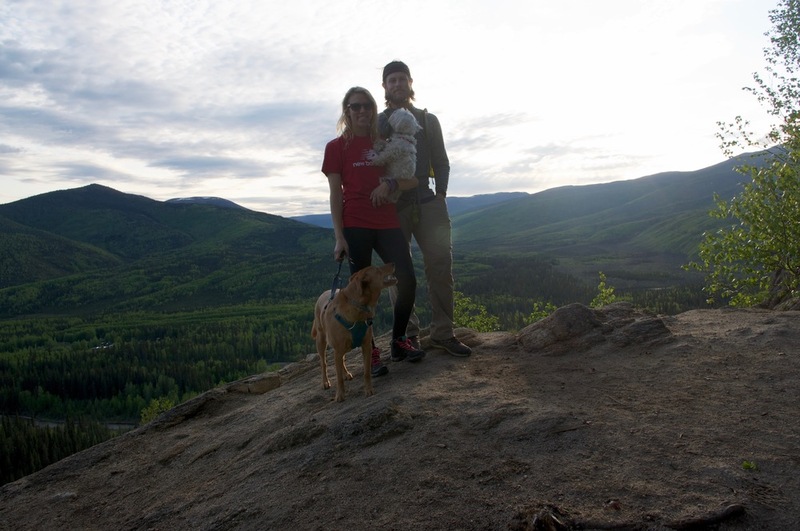 One of the benefits of being in Alaska this time of year was the constant daylight, as I will mention more and more, so we were able to embark on this hike just before 9 pm. It was a popular trail, and while waiting for Brooke to lasso one of the pups I was able to make small talk with one of the town elders and got the 411 on the area. After assuring me it was a challenging yet rewarding hike, he explained to me (in detail) how grizzly bears like to attack people by pinning them down and biting their skulls, and then he handed me what I thought was a business card but actually turned out to be a grassroots promotion for Jesus. Just as promised by the old man, the hike was somewhat difficult, but the views from the top were worth it. The scramble up the rocks gave us a sense of accomplishment and our first foray into hiking in the bear-infested Alaskan woods. If it weren't for our bear bells, bluetooth speaker stereo and random clapping, we surely would have been easy prey. That night clouds and rain moved in, forcing us into the tent a little earlier than preferred. The following day we planned to visit our second hot spring, the aforementioned Chena Hot Springs. Although it had the same sulphur scent as Liard, these springs were as crowded as they were expensive. Although we came out of them refreshed we decided they were, by far, our second favorite springs. As we ventured south towards Anchorage, we passed through Denali State Park and camped for a few nights. There was one hike that wasn’t worth the possibility of being mauled by bears, and a lake (Byer's Lake) that we lounged at and enjoyed some beers, sunbathing and fruitless fishing. Other than that, it was uneventful. Anchorage is just like any other major US city, only with the backdrop of mountains and the feeling of isolation. By the time we reached Anchorage, there was one thing both Brooke and I could agree we needed in our lives - steak. So we went to the only Steakhouse in Anchorage without a dress code: The world-renowned Outback Steakhouse. After dining on seared sirloin, we cruised the city and found a nice RV park with showers and decent Wi-Fi. Over the course of the next two days there, we made it out to the iconic Flatiron Ridge for a hike that offered a nice overlook of Anchorage. It was a view worth a million dollars, but only cost $5 (parking fee at the base). Staying on schedule, we said our goodbyes to Anchorage after and continued south to the Kenai Peninsula to celebrate Memorial Day Weekend.